Media: 82 pages (9½″ high x 7¾"wide) between soft cardboard covers. Conclusion: Whilst there is nothing new to be found by those who have many Hurricane references the book will be welcomed by those who are starting out in the reference collecting world. Histoire & Collections are a French publishing house who specialise in what are essentially photographic genre books. This title is from their Planes and Pilots series of which 14 have been published to date. 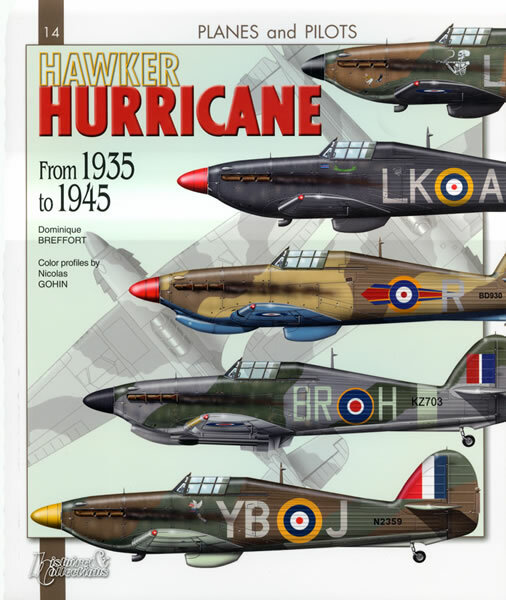 The book essentially provides a potted history of the Hurricane from Mark 1 through to the Mark IV as well as a basic description of the various marks of the Sea Hurricane and those modified for placement aboard the Catapult Armed Merchantman. Text is minimal with a short description of the birth of the Hurricane at the beginning of the book and an equally brief description of the various marks at the beginning of each appropriate chapter. Comprehensive coverage in the form of full colour artwork is provided of each mark following the text at the beginning of each chapter. The artwork is in the form of either left or right hand side profiles with a short description of the depicted airframe. The artwork is beautifully done indeed and each subject exhibits exhaust staining and weathering. There are four machines illustrated per page with 16 pages devoted to the Mk 1, 17 pages to the Mk II, four pages to the Mark IV, three pages to the Sea Hurricane, five pages to “foreign users”, as well as two pages illustrating the mounts of Hurricane aces. The artwork is continued with pages illustrating the “Temperate Land Scheme, Type A and Type B”1938 - 1941, the “Day Fighter Scheme – 1941 - 1945 Type A and Type B, the Desert Scheme (or Middle East Scheme Type A and Type B, and the Tropical Land Scheme, under surfaces camouflage schemes, the various types of national insignia – types A, B and C.
The artwork section is completed with six line drawings that visually illustrate the differences between the various marks. The book is rounded out with a table that identifies each RAF and RN user by squadron and by the squadron code it wore. The book comprises 82 pages (9½″ high x 7¾"wide) between soft cardboard covers. Whilst there is nothing new to be found by those who have many Hurricane references the book will be welcomed by those who are starting out in the reference collecting world.